Let me just say, I hope you’ve committed to a menu by now. This is no time to be deciding between the Harvest Chopped Salad or the Butternut Squash Salad! They’re both great and there’s no wrong choice. Pick one and make the other one for Christmas. The only thing you may not have settled on is whether or not you should do a cocktail. I am here to convince you that yes, you should do a fun drink because we are fun people you and I, and we can’t let this Thanksgiving business make us too stressed out. So, let’s have a drink! 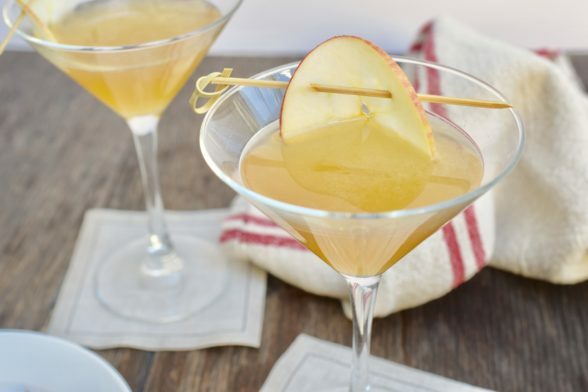 When I was on Hallmark’s Home & Family show last month, Debbie made a delicious apple bourbon cocktail with bourbon, apple juice, lemon juice and maple syrup and I thought, this is the perfect Thanksgiving drink. I am not much of a drinker, by the way. But on holidays and special occasions, I like to enjoy a festive cocktail or glass of wine. Some cocktail recipes are so involved and require so many special ingredients that I’ll never use again, that I am rather unmotivated. But this one was so simple that my husband could do it. I mean, that it wouldn’t be too stressful to prepare with a lot of other things going on and I probably had all the ingredients at home ;). 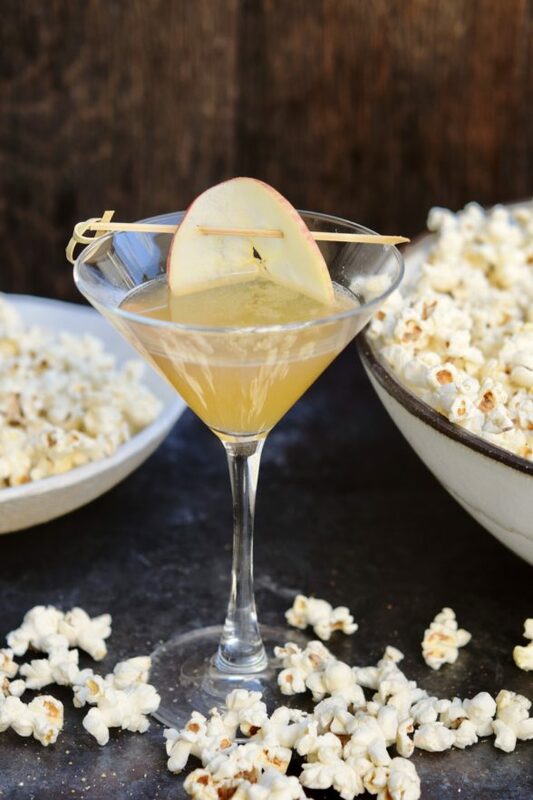 What I like about this apple bourbon cocktail is that it’s not too strong and not too sweet, but it’s light and fresh and feels like fall with the hint of apple. We made a similar cocktail a few years ago and everyone loved it. But I misplaced the recipe and I was so happy to try this one on the show. By the way, they actually served a real cocktail with alcohol during the show and I was buzzed after 1 sip and I still had to do my segment HA! In my quest to analyze every recipe for do-ahead possibilities, I don’t see why you couldn’t mix this up the day before and then serve it on Thanksgiving day, shaken with ice or not. If you want to garnish it like I did here, slice some apples crosswise into super thin slices (don’t core the apple – the seeds look pretty) and brush with lemon water so they don’t turn brown. Lastly, if you don’t have a shot glass with ounce measurements on it, just look at the proportions of the recipe and write down alternative measurements. It’s 1 part maple syrup to 1 part lemon juice to 2 parts apple juice/cider to 4 parts bourbon. 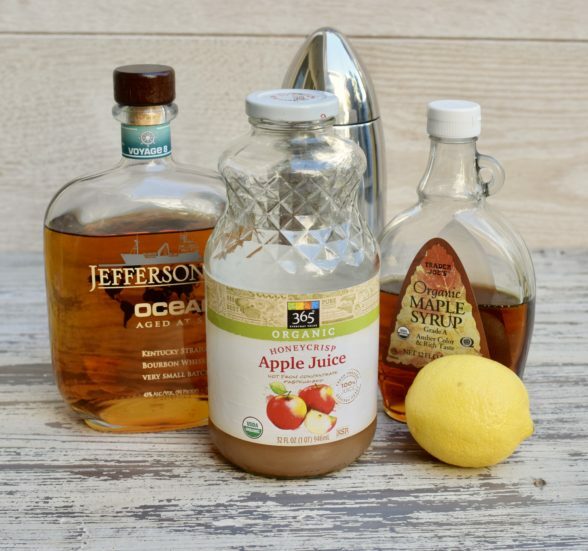 So if you want to make a big batch for a crowd, you could do 1/2 cup maple syrup + 1/2 cup lemon juice + 1 cup apple juice/cider + 2 cups bourbon, which would give you a quart to work with. 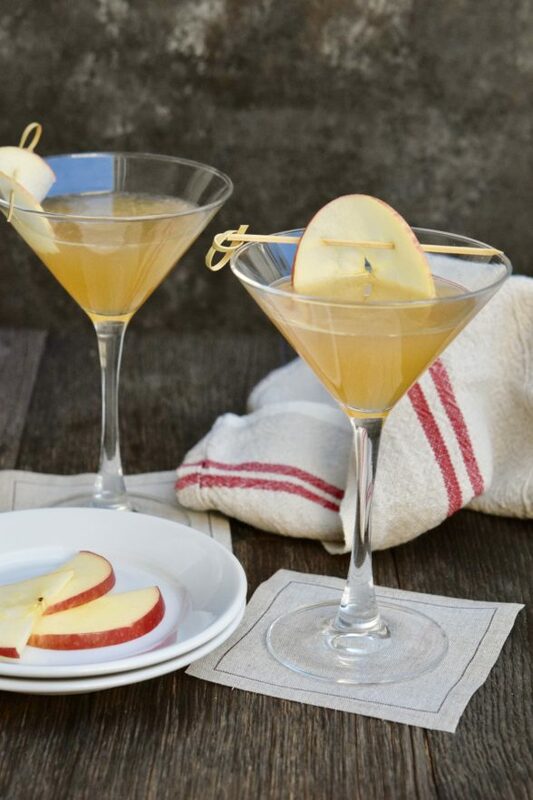 Add bourbon, lemon juice, apple juice, and maple syrup to a cocktail shaker and fill with ice. Shake until well chilled, about 15 seconds, and strain into a chilled coupe. Made these for Thanksgiving and they were SO GOOD!!! These are going to become part of the yearly (and fall) tradition. Don’t you love a delicious and easy cocktail?! 4 parts Bourbon? 🙂 No wonder you could feel it after one sip! Thank you for this recipe-I wasn’t planning to make a cocktail (beyond wine and champagne,) but this sounded too good not to try. Made one tonight for a taste test, delicious! Can’t wait for Thursday, Happy Thanksgiving. It’s so easy, it’s hard to resist! Hope you had a great Thanksgiving!